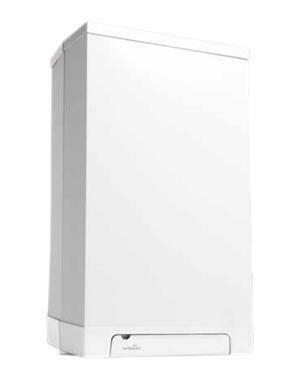 The Rapid 25kW Plus Combi boiler is a highly reliable compact, wall mounted condensing unit that could help you to save money on your energy bills. Designed and manufactured by Intergas, the Rapid Plus Combi is a highly efficient boiler that comes with an efficiency rating of 94% and an ErP A rating. With the boiler having an output of 25kW, it’s perfectly suited to medium-sized homes that don’t have such an excessive need for heating and hot water. The range also includes a 32kW boiler, so there’s a model for larger homes too. Thanks to being compact, you’ll be saving some much needed space around the home but despite its size your home will benefits from a host of features. The Rapid Plus condenses at 100% in both heating and hot water modes, features a high efficiency pump, a built-in digital clock, a flow rate of up to 13.2 litres per minute, a central flue with flue lengths of up to 13m, just 4 moving parts and it’s a 5 in 1 boiler which means that while it’s a Combi boiler it can be converted into a System, Open Vent or multipoint by simply changing the parameter settings in the software. The unit also comes with a built-in expansion vessel, a heat exchanger can reduce heat loss and deliver the best heat transfer, fixing bracket, mirrored sight glass and is available as an LPG or natural gas boiler. As this is a Combi boiler, it supplies heating and hot water on demand by using the mains water supply which means that you don’t need to have a bulky tank or cylinder, perfect for smaller homes or properties with limited space. This unit however can be converted to a Regular (Heat Only) or System boiler. Featuring a 7 year warranty on the heat exchanger and a 6 year warranty on parts and labour, you’re covered long after the installation.